Although many brokerage firms have their own analysts, you do need to know some of the basics of securities analysis to pass the Securities Industry Essentials exam (SIE) and co-requisite exams. 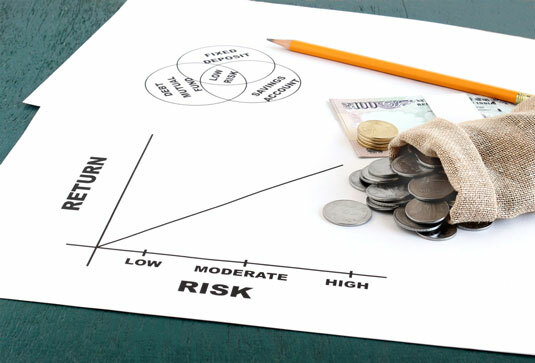 Investment risk is a topic covered on the SIE exam. Market (systematic) risk: The risk of a security declining due to negative market conditions. All securities have market risk. Business (nonsystematic) risk: The risk of a corporation failing to perform up to expectations. Credit risk: The risk that the principal and interest aren’t paid on time. Moody’s, Standard & Poor’s, and Fitch are the main bond-rating companies. Liquidity (marketability) risk: The risk that the security is not easily traded. Long-term bonds and limited partnerships have more liquidity risk. Interest (money rate) risk: The risk of bond prices declining with increasing interest rates. All bonds (even zero-coupon bonds) are subject to interest risk. Reinvestment risk: The risk that interest and dividends received will have to be reinvested at a lower rate of return. Zero coupon bonds, T-bills, T-STRIPS, and so on have no reinvestment risk because they don’t receive interest payments. Purchasing power (inflation) risk: The risk that the return on the investment is less than the inflation rate. Long-term bonds and fixed annuities have high inflation risk. To avoid inflation risk, investors should buy stocks and variable annuities. Capital risk: The risk of losing all money invested. Because options and warrants have expiration dates, purchasers may lose all money invested at expiration. To reduce capital risk, investors should buy investment-grade bonds. Regulatory (legislative) risk: The risk that law changes will affect the market. Currency risk: The risk that an investment’s value will be affected by a change in currency exchange rates. Investors who have international investments are the ones most affected by currency risk. Nonsystematic risk: A risk that is unique to a certain company or a certain industry. To avoid nonsystematic risk, investors should have a diversified portfolio. Political (legislative) risk: The risk that the value of a security could suffer due to instability or political changes in a country (for example, the nationalization of corporations). Prepayment risk: The type of risk mostly associated with real-estate investments such as mortgage-backed securities. Mortgage-backed securities have an average expected life, but if mortgage interest rates decrease, more investors will refinance and the bonds will be called earlier than expected. Timing risk: The risk of an investor buying or selling a security at the wrong time, thus failing to maximize profits. On the SIE exam, to determine the best investment for a customer, pay close attention to the investor’s risk tolerance, financial considerations, non-financial considerations, risk(s) mentioned, and so on. Certainly, all investments have a certain degree of risk. Younger investors, sophisticated investors, and wealthy investors can all afford to take more risk than the average investor. However, when you are talking to your clients, you should help them make decisions that will help them mitigate their risk. Following are a few topics that you may potentially be asked about on the SIE exam. Geographical: Investing in securities in different parts of the country or world. Buying bonds with different maturity dates: Buying a mixture of short-term, intermediate-term, and long-term debt securities. Buying bonds with different credit ratings: You may purchase high-yield bonds (ones with a low credit rating) with highly rated bonds with lower returns so that you get a mixture of high returns with the safety of the highly rated bonds. Investing in stocks from different sectors: Often, certain sectors of the market perform better than others. By spreading your investments out among these different sectors, you can minimize your risk and hopefully make a profit if one or more sector happens to be performing well. The sectors include financials, utilities, energy, healthcare, industrials, technology, and so on. Type of investment: Investing in a mixture of different types of stocks, bonds, DPPs, real estate, options, and so on. There are certainly many more ways to diversify a portfolio than the ones listed previously — use your imagination. In addition, they aren’t mutually exclusive. Remember that mutual funds (packaged securities) provide a certain amount of diversification within an individual stock. This is why smaller investors who may not be able to afford to diversify their portfolio are ideal candidates for mutual funds. Say that you and one of your clients determine that it is best for her to have a portfolio of 50 percent equity securities and 50 percent debt securities. After setting up and purchasing the portfolio, one year later, due to appreciation, your client now has 60 percent in equity securities and 40 percent in debt securities. At that point, your client may decide to rebalance her portfolio by selling some equity securities and purchasing more debt securities to help maintain her original desired level of asset allocation (50-50). As a matter of fact, there are mutual funds called asset allocation funds that will rebalance the portfolio of securities held by the fund without needing to contact the shareholders. Typically, as investors age, they can’t afford to take as much risk and should change their asset allocation to include fewer equity securities and more debt securities. I’m sure you’ve heard of the saying, “Hedge your bets.” In the gamblers’ world, this may mean taking insurance to protect oneself against the possibility of the dealer getting a 21 when playing blackjack. What it means is that you are trying to reduce your risk. The problem is that by doing so, you may be limiting your upside potential. In the investors’ world, there are several ways to hedge depending on what you’re investing in. To hedge against market volatility (the risk that the market will fluctuate in price), you can hedge (protect) by having a diversified portfolio. In this case, although some of your investments may be subject to big swings in price, others will remain stable or increase when the market decreases. A well-diversified portfolio may include short- and long-term bonds of varying credit risk, cash equivalents (in other words, money-market funds), all sorts of equity securities (value, growth, large-cap, small-cap, and so on), real-estate investments, commodities, and so on. To hedge against credit risk (the risk that bond issuers default), you can purchase some more secure debt securities issued by the U.S. government (T-bills, T-notes, T-bonds, and so forth), debt securities issued by local governments (municipal bonds and municipal notes), debt securities by higher-rated corporations, and so on. Inflation risk is the risk that a security doesn’t keep pace with inflation. To hedge against inflation risk, you can purchase stocks, variable annuities, real estate, commodities (raw materials or agricultural products), or even TIPS (Treasury Inflation Protected Securities). There are many different types of risk, as you can see from the previous section. There are different ways to hedge against risk depending on which risk you’re concerned about. The preceding are just a few examples. Options can also be used to hedge against the risk of a security you own going in the wrong direction. The best way to limit risk for most investors is to have a diversified portfolio. You must also understand that in most cases, older investors can’t afford to take as much risk. For SIE exam purposes, the main thing you need to remember is that hedge means to protect and work it from there.